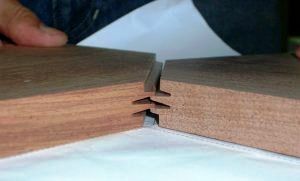 This is a picture of the fingerjoint connection we use to connect the different frame parts. We are Martien Buist and Freddie Veltens and we live in the Netherlands. We are colleagues at Schuitema Furniture Company. 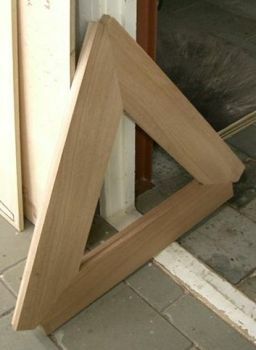 This is a company that produces high-quality furniture. We just started with the construction of two (modified) Riviera's. The frames are ready. Right now we are busy with the chine and battens. 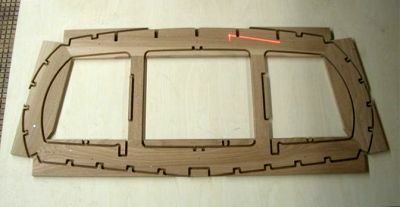 In this picture you can see how the CNC machine changes the rough part into a transom. Including all the notches and necessary holes. 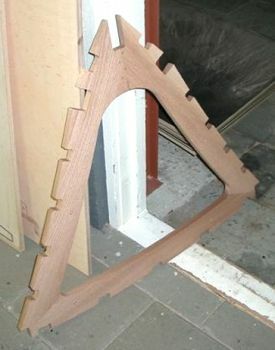 In this picture you can see one of the frames before and after the CNC machine.